10 REASONS YOU SHOULD HAVE GONE TO MOONDANCE JAM! You won’t find a nicer group of people willing you to help you out on a moments notice. We had a group of campers next to us from the Iron Range who would not stop helping us out! We had a pretty good injury take place at our site (it ended up requiring four stitches and leaving some pretty good bruising) and the EMTs in the group were over with ice packs and a splint and had it wrapped before we knew what was going on. Our trailer lights weren’t working right and the electrician in the group had it rewired in less time than it takes to finish a 12 oz beverage. I had invited them to sit around our campfire one night and they went and got their own firewood. Moondance Jam = Good People. 9) PEOPLE HAVE NO FUN AT ALL. You also will find a variety of people dressed up in all sorts of outfits. From 80’s gear (for the Hairball show) to random costumes at different themed campsites. You might also find a stormtrooper. These are not the beers you are looking for. You might also find a stormtrooper selling donuts. You may not have a better opportunity to show off your backyard skills than in the various campsite sporting events. Bags are literally thrown at every 5th site. Frisbees are aimed at cups resting on top of poles. Ladder toss, beer pong and more can be found just about anywhere you look. Your trophy? You might already be carrying it. It’s like a big ol’ family reunion. After going for nearly 10 years, you start to recognize the people there. If you find a good site, you stick with it and you get to know the people camping next to you. You become friends. You hang out in real life (if you live close enough) and you get together to celebrate being halfway to next year’s Moondance Jam. These guys are REALLY close. I’ve been to other festivals around Minnesota and the neighboring states and none of them compare to Moondance in terms of how well people get along, how clean they keep it and how professional the staff is. It’s well-run and the attendees all seem to get along with each other. You will always run into a few bad apples everywhere you go, but while you feel the need to HAVE to excuse yourself to VIP at other festivals, you can come and go and stay whereever at Moondance without any worries. The reserved campsites sell out quickly and have a noise curfew to allow for some time to rest before getting up and going at it all again the next day. It seems like the people that go to Moondance just know how to have a good time without ruining it for everyone else. Halestorm from the 2013 Jam. I haven’t even gotten to the bands yet! Sublime played this year and while not everyone will be familiar with them, they have been around for a lot of years. Sort of. (Here’s more about them via Wikipedia) Their lead singer Bradley Nowell, passed away back in 1996. Just before the release of their breakthrough album. Their music lived on and they have since regrouped with original bass player Eric Wilson, along with a new lead singer named “Rome” and toured northern Minnesota for the first time that I can remember. Sublime was a band that I listened to a lot 20 years ago and finally had the chance to see. Moondance has done that a lot for me. 3) CAMP IN AN ICE CASTLE! You can camp in an Ice Castle and you won’t be the only one. For the second year in a row now, I’ve camped in an Ice Castle (check out their new manufacturing plant in Pine River called Northern Sales and Manufacturing, between Walker and Brainerd on 371). The model I had slept 5, offered plenty of storage, easy set up and, most importantly, air conditioning. My days of tent camping at festivals were short-lived. I prefer climate control and security and an Ice Castle provides that. Even had plenty of room for the new “HOPPER” from Yeti. It’s coming in October! A new durable, portable cooler that’s tough as nails. Every year something happens on stage that surprises me. A few years back Heart blew me away. Big Head Todd in the Monsters put on a great show. Halestorm was unbelievable. Sammy Hagar and Slash will go down as some of the best shows I’ve ever seen. Seether was great this year and when they played “Heart Shaped Box” from Nirvana, it seemed like they were channeling Kurt Cobain. 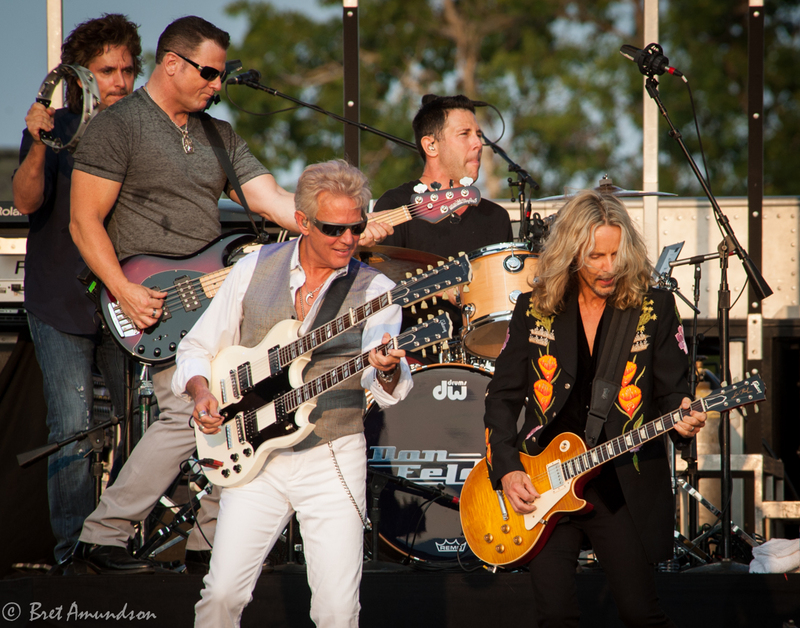 Don Felder from the Eagles played this year and while I respected what he’s done, I wouldn’t have been upset if I would have missed his show (with as many bands that play at Moondance, you just can’t see them all). We caught the show and happened to see him play Hotel California! Plus he brought out his tour mates from Styx and Foreigner to join him. Watching him and Tommy Shaw trade off on the solos was one of those moments I’ll remember for a long time. 1) YOU CAN GO FISHING! Let’s not forget that Moondance Jam is almost surrounded by Leech Lake. 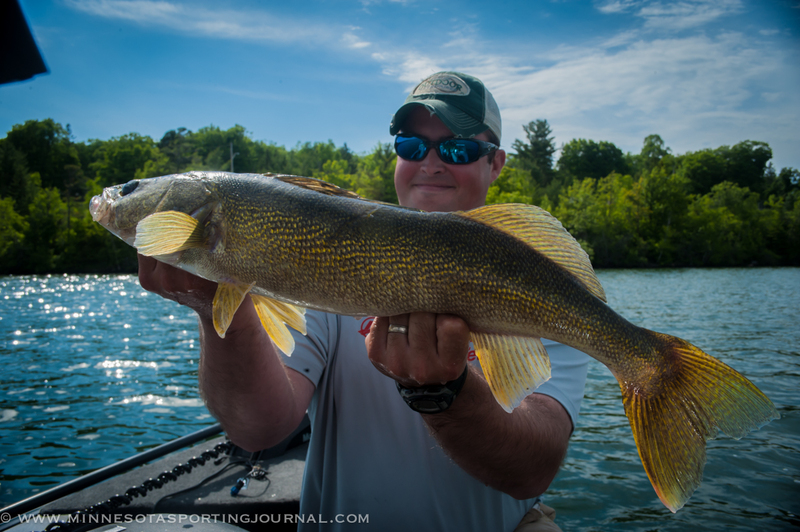 You want to fish one of the best lakes in Minnesota? It’s just a couple minutes away from the Jam. Jason Freed with a Leech Lake walleye. Next HOW LONG DOES IT TAKE TO GROW A 50″ MUSKIE? Great reasons and I can think of many more! Great article!